I've been using Brushes on my iPhone for a few days now and I must say that after some time getting use to it, it's a pretty sweet app! This is an example of what I've drawn yet with the app. It is generated with a small free tool for OS X that can read drawing made with brushes. Using gameQuery and jQuery allow a higher level and cross-browser approach to the game display. 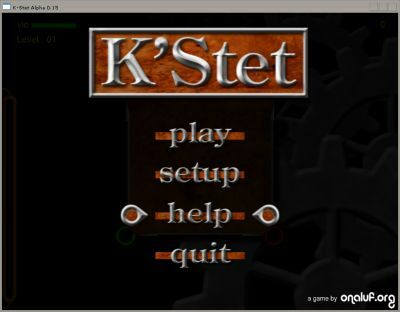 K-Stet is a small game I wrote in OpenGL a while ago. It's not really finished yet and will probably never be... The source code is given with the game. You'll find bellow different versions of the game. It's build on the OpenGLUT framework and uses SDL to read the images files so it shouldn't be to hard to compile it on every reasonable platform but only the win32 binary are given for now. The aim of this was to test a gameplay idea that turned out to be not as fun as I expected. In the game you control the rotation of a board on which drop colored drop of water fall. The drops should be lead to the hole with the same color. Try it maybe you'll find it more fun than I do. A skin for the SLVR L7 made with Skinner4moto. Since I don't know much about these mobile phone I don't know if it can be used with another model. If you don't know how to install this skin on your L7 then Google is your friend! 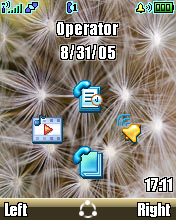 The wallpaper is a resized version of Fireworks by Cartographer. This website is made with a custom blog engin, as soon as the code source reaches a acceptable quality level it will be released here.